The present dynasty built its palace on an earlier dynasty's cemetery, incorporating the ancestors who owned the land. 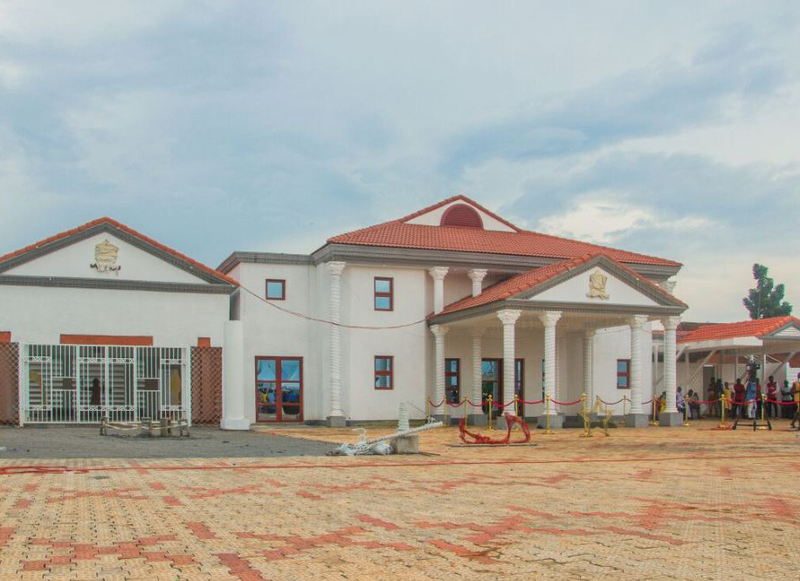 The Benin palace (eguae) shares many contemporary elements with royal accommodations worldwide: air conditioning, electricity, electronics, and a glamorous new facade–an innovation of the current monarch, Oba Ewuare II. Altars to the monarchs of the past, buried in the living quarters they once occupied, nonetheless remain the spiritual heart of this royal compound. Still, externals have always been important, for they reinforce the monarch’s ultimate social status. Many of Benin’s architectural innovations began with the palace, whether they were Oba Esigie’s 16th-century introduction of a shingled roof, Oba Ovoranmwen’s late 19th-century novel use of corrugated metal sheeting for the same purpose, or his mirrored bedroom ceiling. 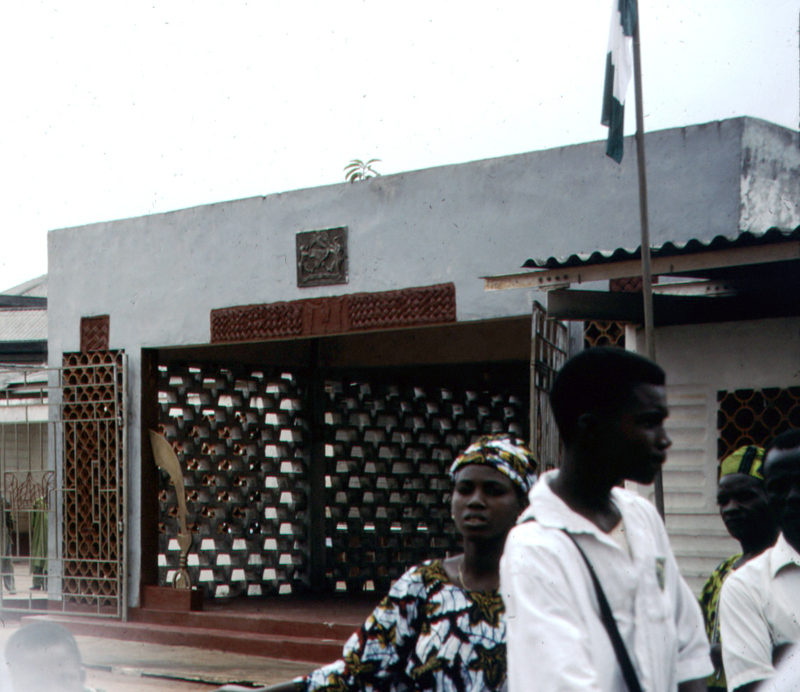 Sumptuary laws still affect Benin architecture. 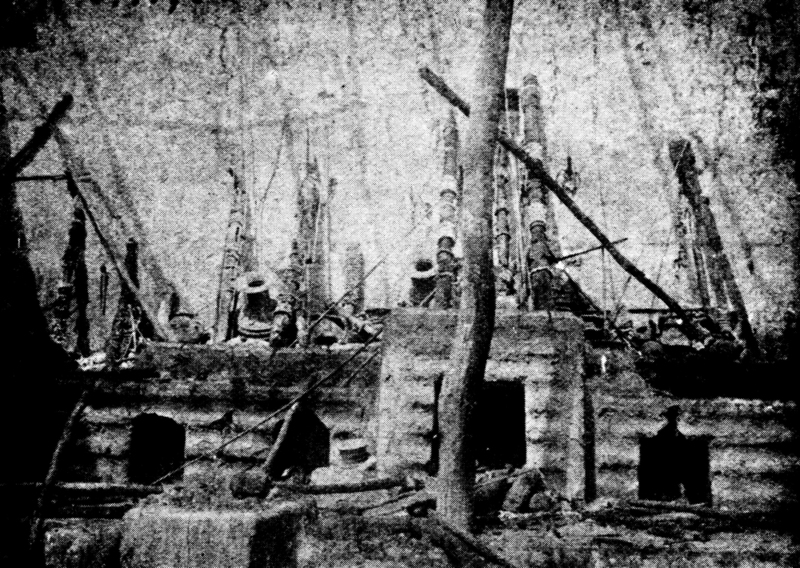 Only the monarch and those chiefs to whom he grants the privilege may score their walls with the horizontal grooving (eken agben) that marks rank, a feature incorporated into current cement buildings, as well as older earthen construction techniques. When the latter were the norm, the palace had walls that were built from five to nine courses or layers high; most other citizens were limited to four, although a few privileged chiefs were permitted to have five. The earthen walls were thick—usually two to three feet at the base, thinning as they rose. That produced an insulating effect that, combined with shaded passages and the lack of exterior windows, helped to keep the interiors cooler. Our knowledge of the original palace is limited. The first dynasty’s monarchs, known as the Ogiso, resided elsewhere in town, its location disputed. 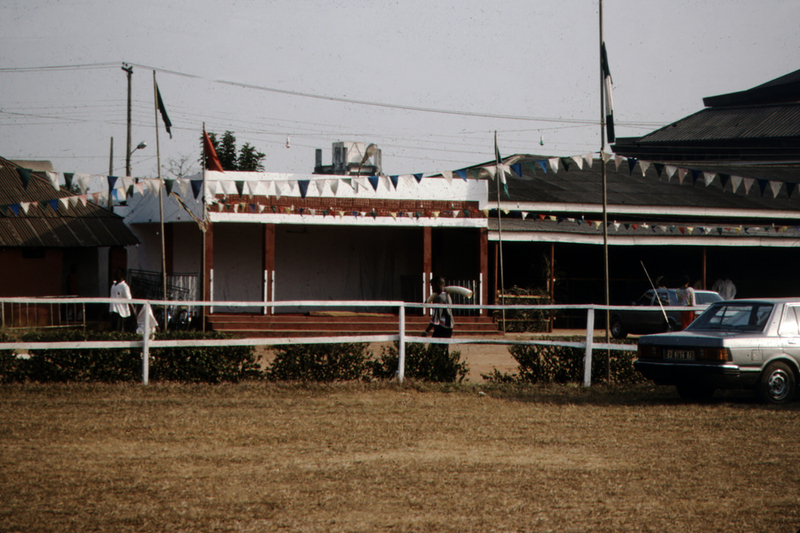 When the present Oranmiyan dynasty was initially established, the first few monarchs had their palace at Usama, in that sector of the city where the Usama chiefs who invited them lived. It was not until the reign of Oba Ewedo in the 14th century that the inner section of the town was breached. 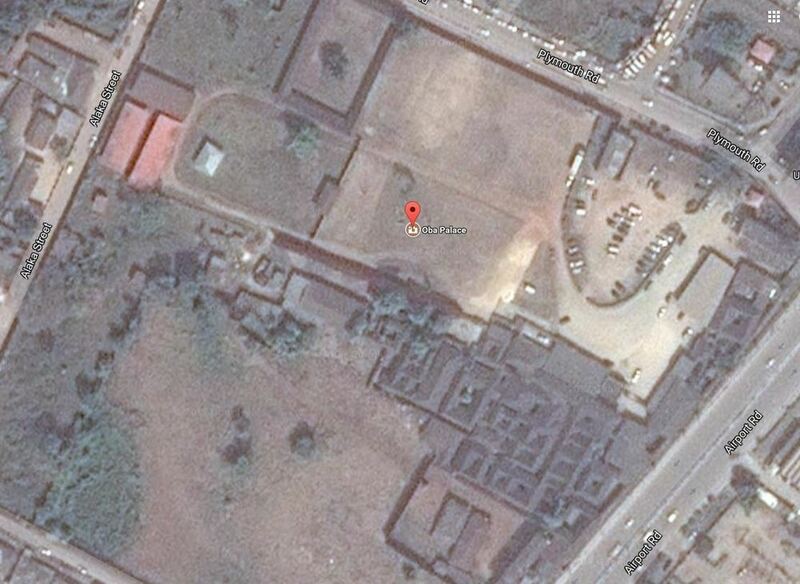 Ewedo built his palace where the royal residence still stands: land the indigenes had used as a cemetery. 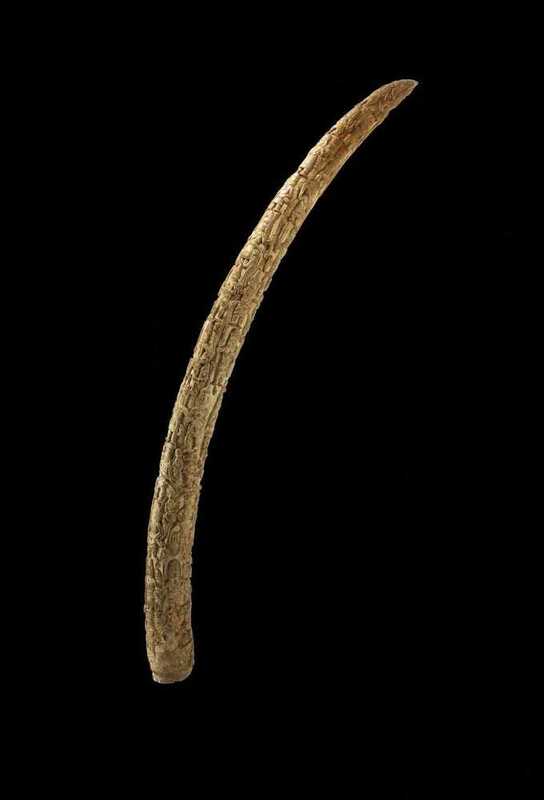 This ensured that the dynasty, which had entered Benin from the Yoruba city of Ile-Ife, had suzerainty over the ancestral forces that owned the land. 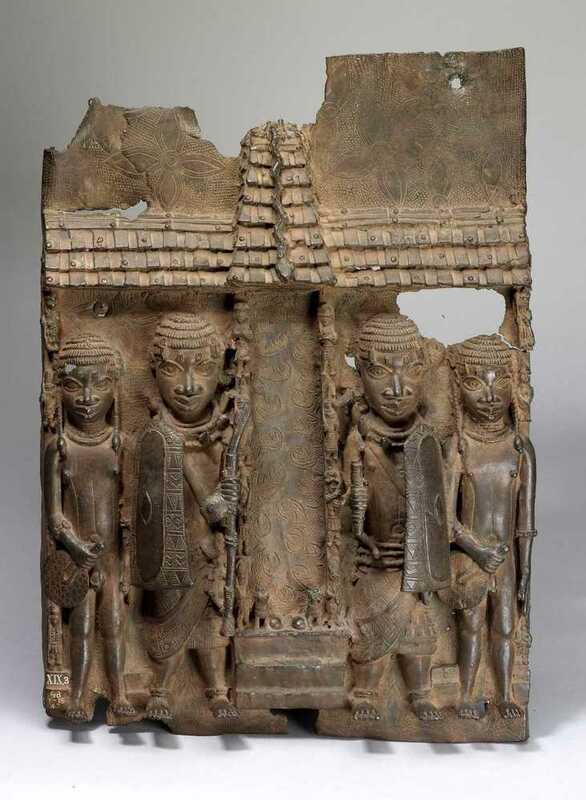 While the palace's structures have changed significantly over time, what little archaeology has occurred took place on what were once palace grounds—small areas on the Benin Museum grounds and the site of the former Clerk's Quarters. Even those limited excavations revealing. Connah discovered segments of pottery shard pavements reminiscent of Ile-Ife, their date coinciding with the Oranmiyan dynasty’s establishment of the current palace site. These dropped out of use long ago. Extensive decoration marked palace structures. 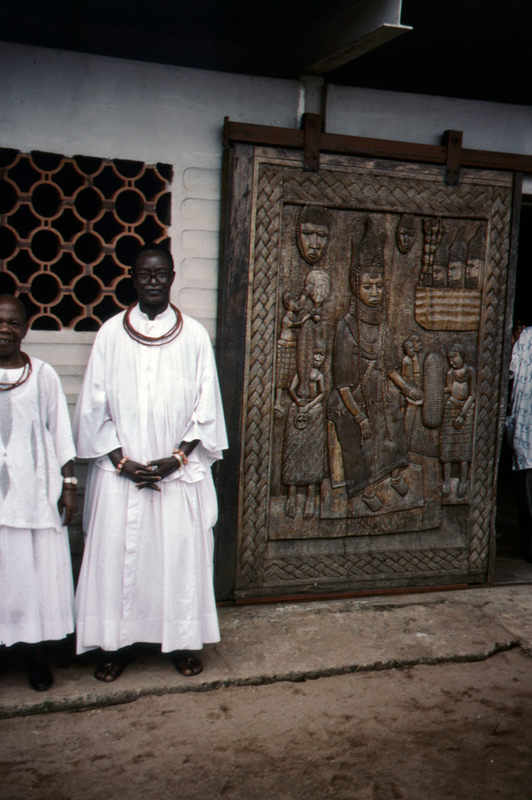 In the 16th century, Oba Esigie constructed a reception hall whose wooden verandah supports were decorated by over 800 brass plaques depicting court officials, animals, Portuguese visitors, and other subjects. 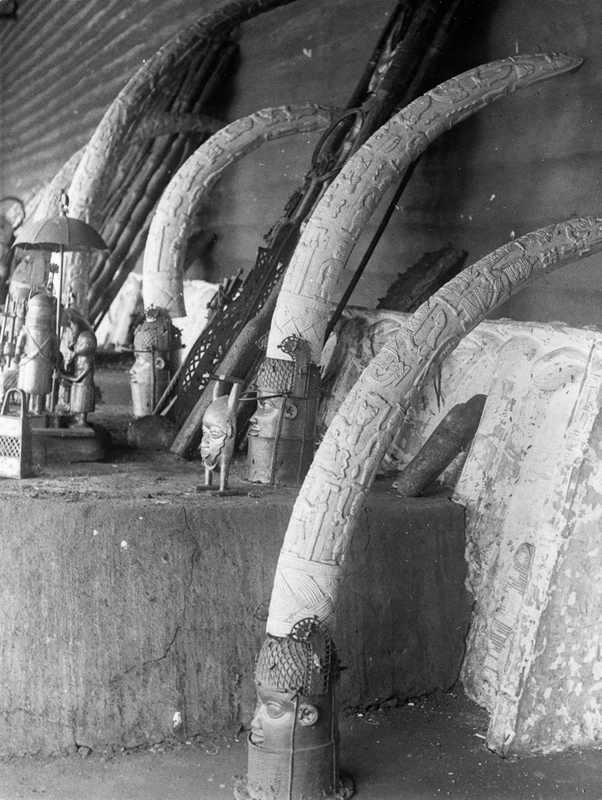 Royal ancestral altars bore cast metal heads, carved ivory tusks, brass figures, wooden staffs and other decorations. 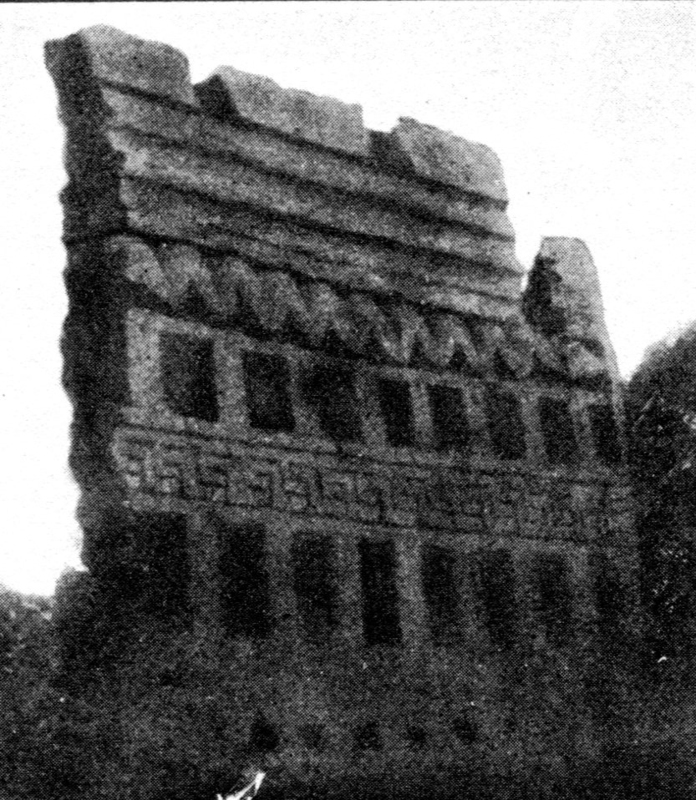 Walls included patterns beyond fluting, and sometimes incorporated modeled clay tableaux. 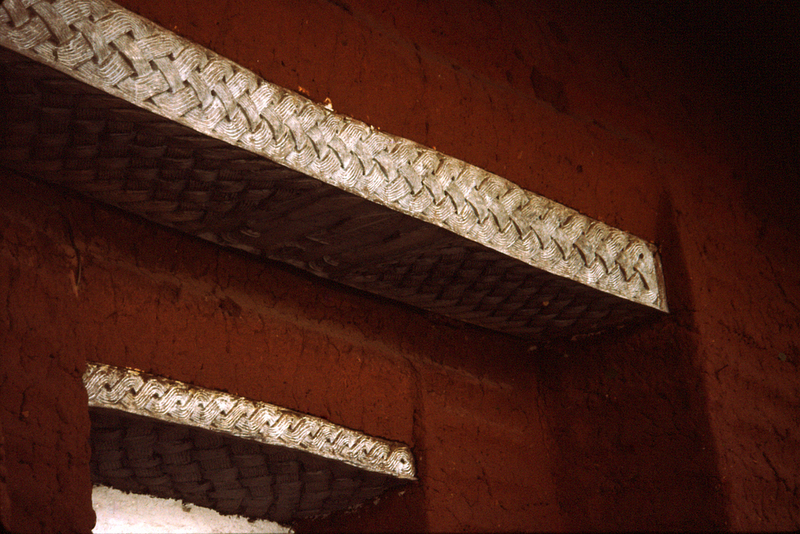 Wooden lintels decorated with interlace motifs or carved figurative scenes were visible in passageways, and patterned brass sheets decorated some lintels and doors. Cowrie shells, a precolonial currency, were pressed into some clay flooring in the form of animals or courtiers, a practice that flaunted the Oba’s wealth. The palace was once considerably larger than it is today. Seventeenth-century visitors remarked on its many galleries and courts, as well as the reflective surfaces of its burnished red earthen walls, described by the 17th-century author Dapper as “as shining as a looking glass.” Towers topped by brass birds standing over snakes were visible over the perimeter walls, making the Oba’s home larger, taller, and far more imposing than any other city buildings. 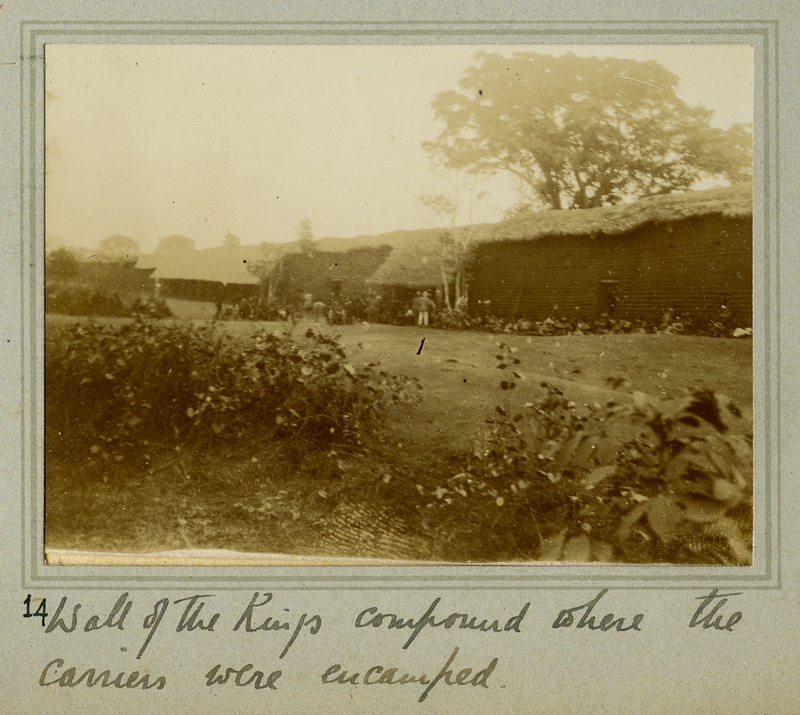 Like many African households, space within the palace moved inward, from public to private. 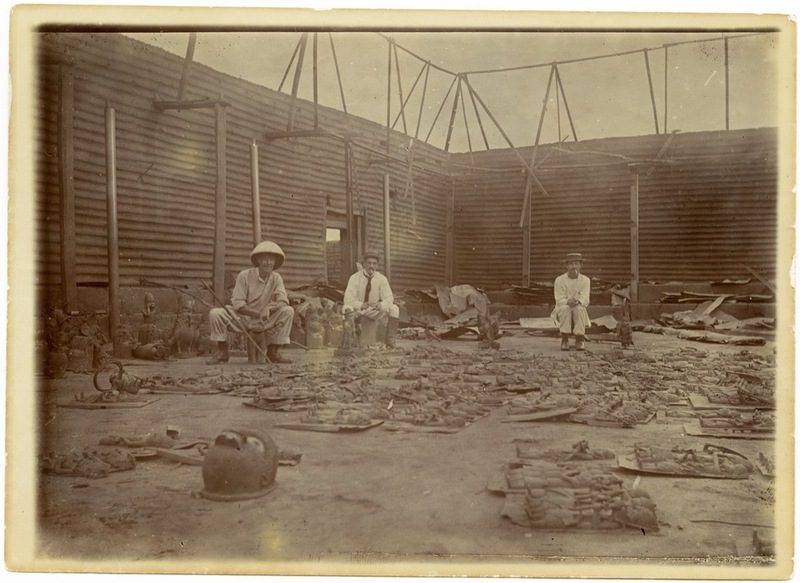 Large-scale activities took place in the open areas and forecourts, while reception areas ranged from royal encounters with chiefs, subjects, and visitors to more intimate ones. Despite its size and costly decorations, the palace's basic design--rooms arranged around open courtyards with impluvia, bordered by shaded galleries with a compluvium opening in at the center--was aligned with that of chiefs and other citizens. 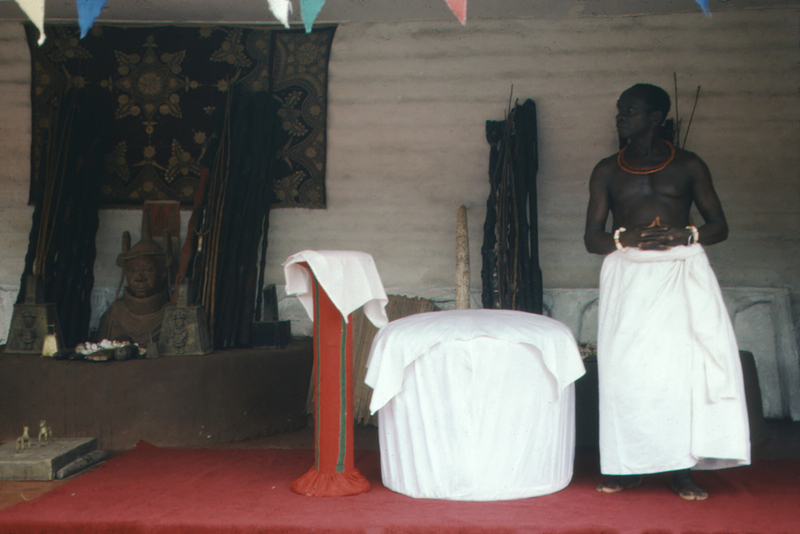 When an Oba joined his ancestors, he was buried in the courtyard that held his suite of personal rooms, and the altar erected over his grave served as a focus for sacrifice and ritual. When his successor took the throne, he had new personal quarters erected. 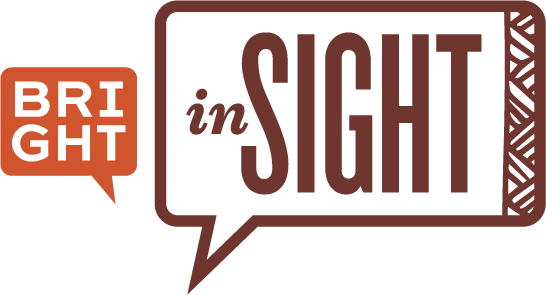 Destruction–both accidental and deliberate–encouraged innovations via rebuilding. Goodwin’s limited excavations revealed that a single segment of the former royal compound that showed evidence of four successive blazes. 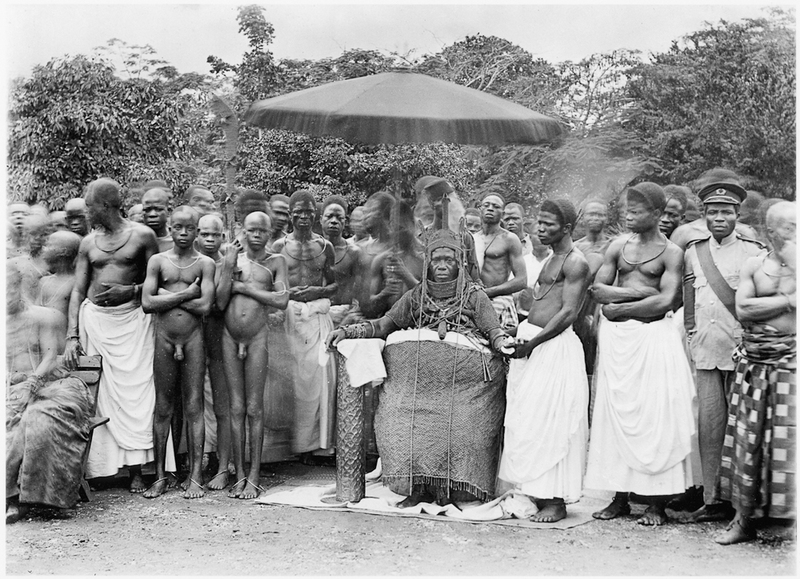 Accidental fires periodically occurred, as in 1922, but succession disputes caused Oba Ewuare I to burn both palace and town, while the short-reigned Oba Egbebo restricted himself to torching the palace. The British were responsible for the greatest palace devastation, however. 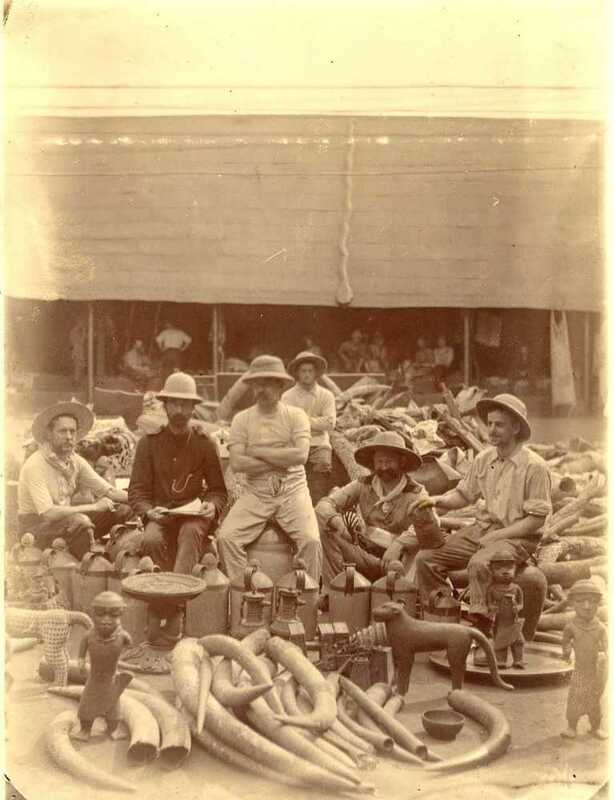 In 1897, in retaliation for the death of a few Britons (who had been warned not to come) eager to force Benin to become part of a “Protectorate” and agree to exclusive trade, the British Navy led an assault on the city. They fought their way to the palace, which the monarch finally had vacated during the bombardment, and took possession of kingdom. 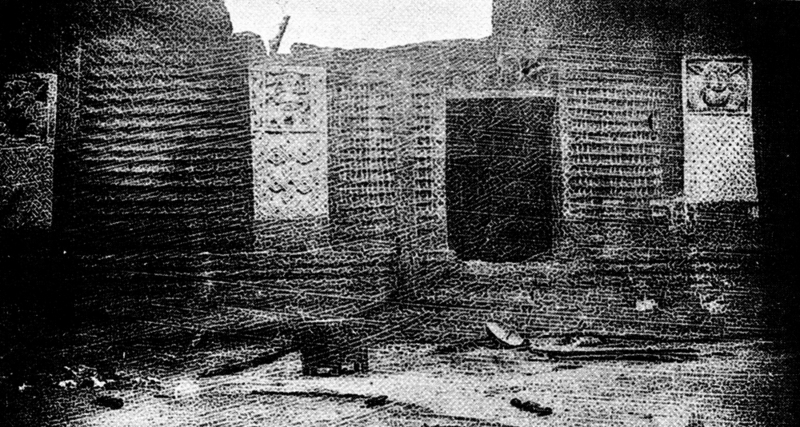 They used explosives on the area bordering the palace, in order to, as Roth put it, “enable the invaders to defend their positions should the Binis return to the fight.” Clearing the shrines of their altarpiece decorations, they removed personal and state objects for shipment to Britain, where they subsequently were sold and scattered to museums and collections worldwide. 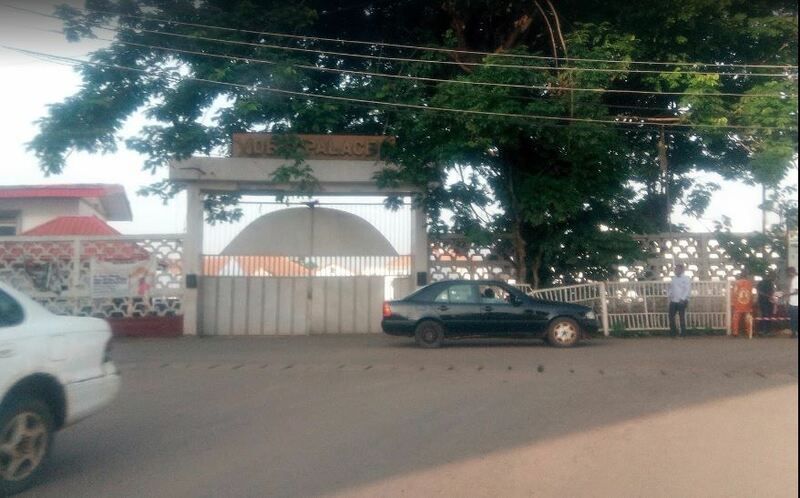 While the soldiers were bivouacked in the royal compound, the palace and ultimately much of the surrounding Ogbe quarter caught fire and burned for three days. 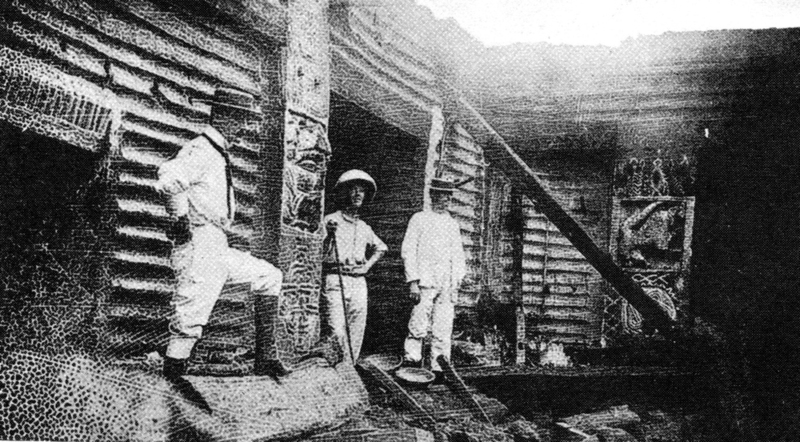 After clearing the debris, colonial administrators carved up the extensive grounds. 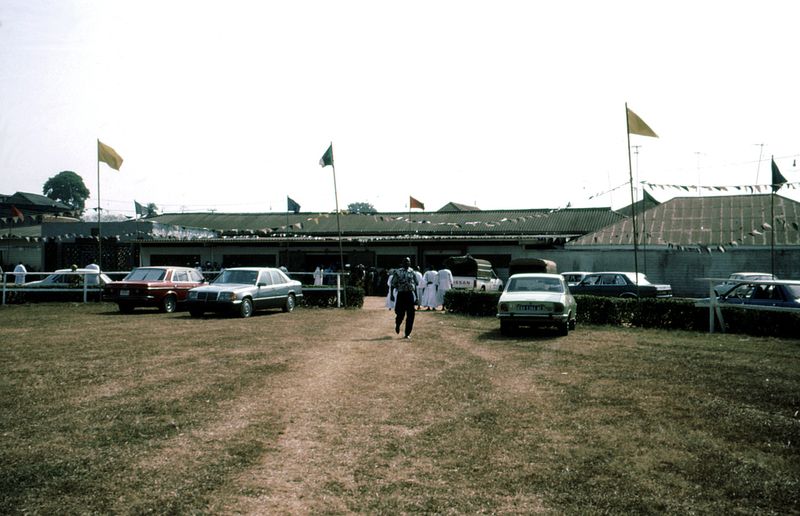 Roads cut through the space; the current museum complex, Ring Road, the prison and the former Clerk's Quarters were all once part of the palace. 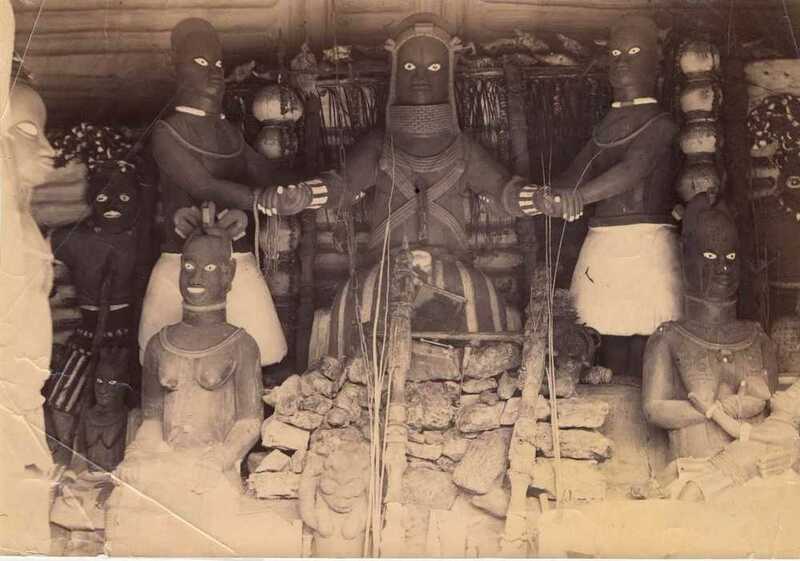 In 1914, after the death of his father, Oba Eweka II took the throne and began reconstructing both structures and altars. 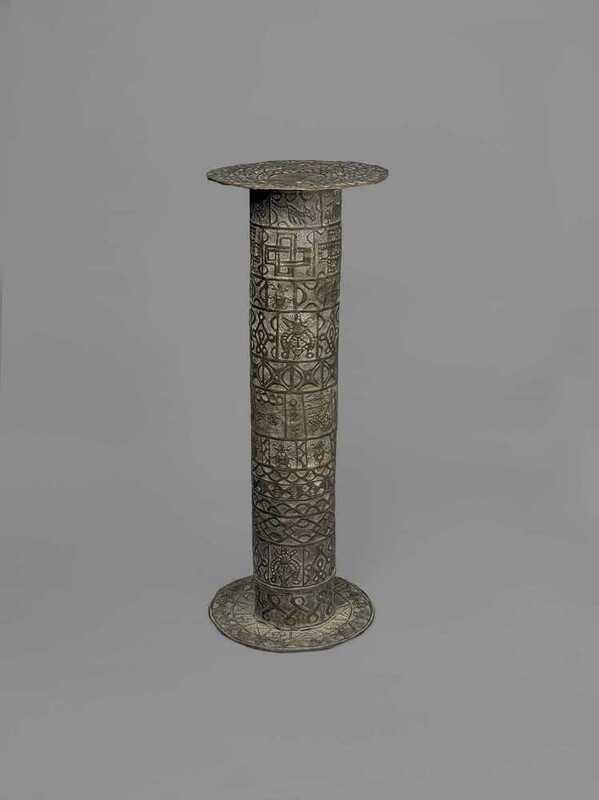 He created a large freestanding courtyard, the ugha, that included both a joint altar for all prior monarchs, whose quadrangles had been destroyed, and individual altars to his father Oba Ovoranmwen and his grandfather Oba Adolor. This quadrangle is the site of some of ceremonies held during the December/January festival period, including Ugie Erhoba, which honors the current monarch’s father, and Ugie Iron, which recreates a 16th-century power struggle. 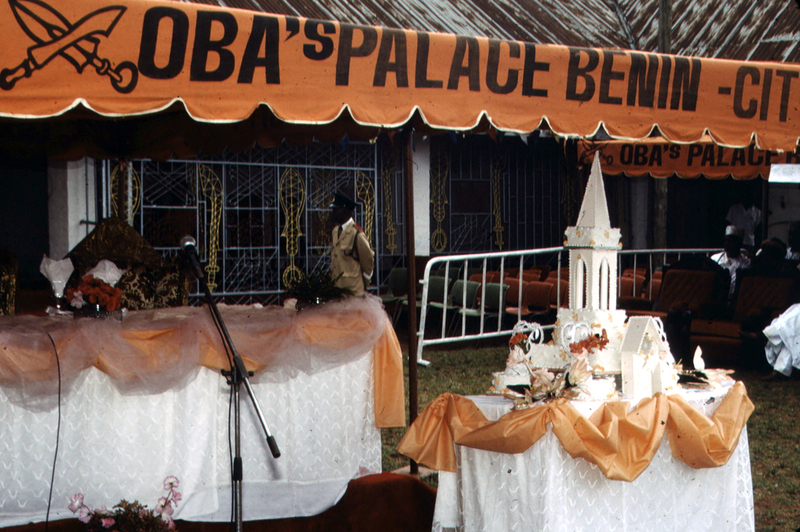 His son Oba Akenzua II 's innovations included a billiards room and air conditioning. 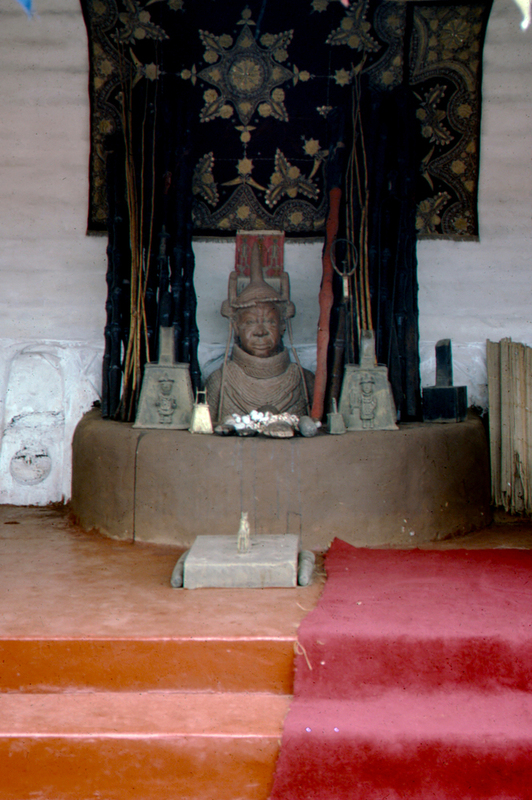 Akenzua's palace commissions to the artist Ovia Idah included an enshrined cement and clay figure of late 15th-century/early 16th century Oba Ozolua (made ca. 1947-50). Erected in the open area in front of the present palace, its position marks where his courtyard once stood. This open area hosts palace ceremonies such as Igu’Oba, which honors the monarch’s head and destiny, and Ugi’Ewere, the celebration that closes the festival season. Idah also produced cement and clay portraits of royals that were part the palace’s façade at that time. 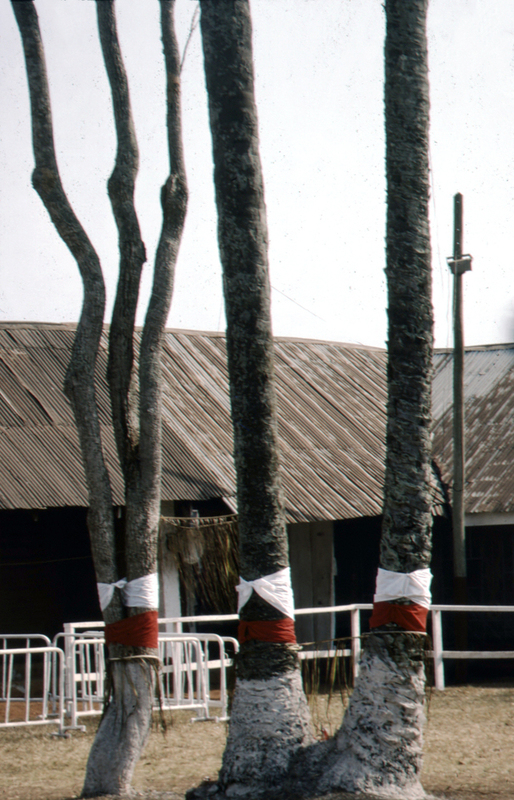 In the 1960s, he replaced these deteriorated palace decorations with five reliefs of monarchs and two of royal wives, the effect recalling both the clay reliefs on former palace pillars and the hundreds of 16th-century brass plaques Oba Esigie had cast and nailed to the wooden supports of his reception court. 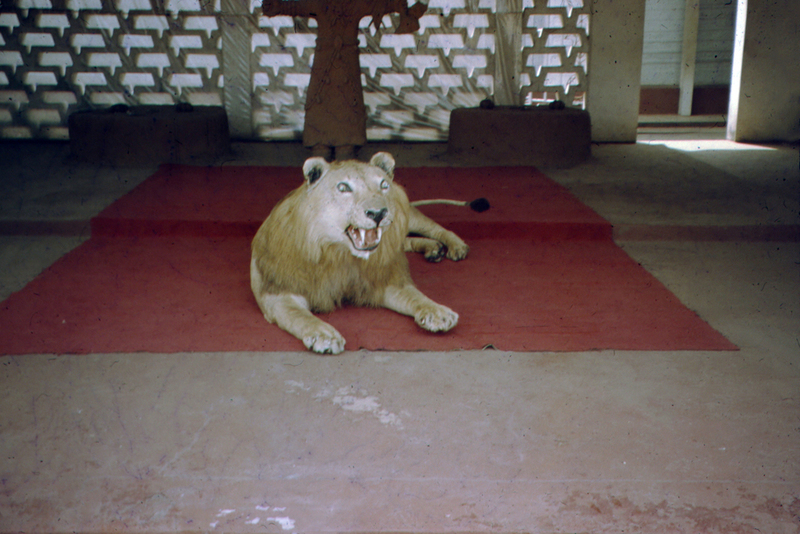 Some of Oba Erediauwa’s subjects urged him to create a palace in contemporary style like those of certain of his Yoruba counterparts, but he was uninterested. 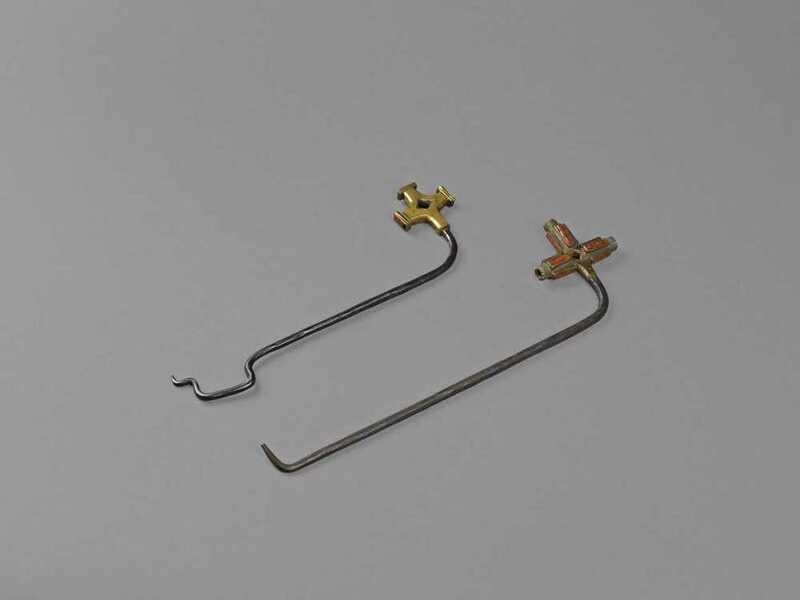 At the time of his installation he did, however, replace the earthen palace entry with a steel gate, and introduced other innovations that were less noticeable. 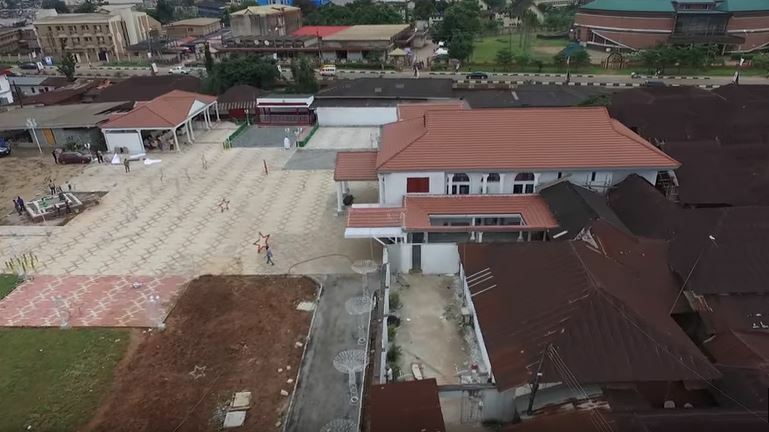 Oba Ewuare II completely revamped the palace’s public face before his installation in October of 2016, although he retained most of the structures behind the façade, as well as the courtyard with ancestral altars. Color integrates old and new: the red roofs of the new structures harmonize with the palace’s earthen walls and a small section of the newly paved forecourt, while new white structures match the repainted cement sections of old buildings, the front fencing, and the bulk of the forecourt. The palace’s new entry building is a sizable two-story streamlined Neoclassical mansion, its entrance marked with a columned portico. The emphasis on red and white reflects these colors’ symbolic importance: white stands for purity and peace, and is the color associated with Olokun, the deity of the sea whose palace the monarch’s is said to imitate; red, on the other hand, is associated with power. 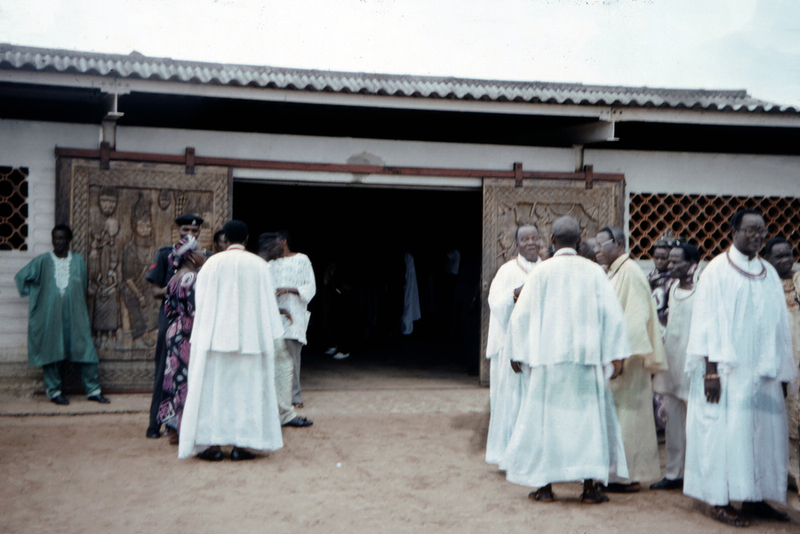 Today’s palace compound still includes a sacred grove, as well as a school for male pages, the Oba’s secretary's office, a library, and the Benin Traditional Council's suite, as well as the royal ancestral shrines, shrines to other deities, meeting and reception rooms, and the private quarters of the Oba and his wives. 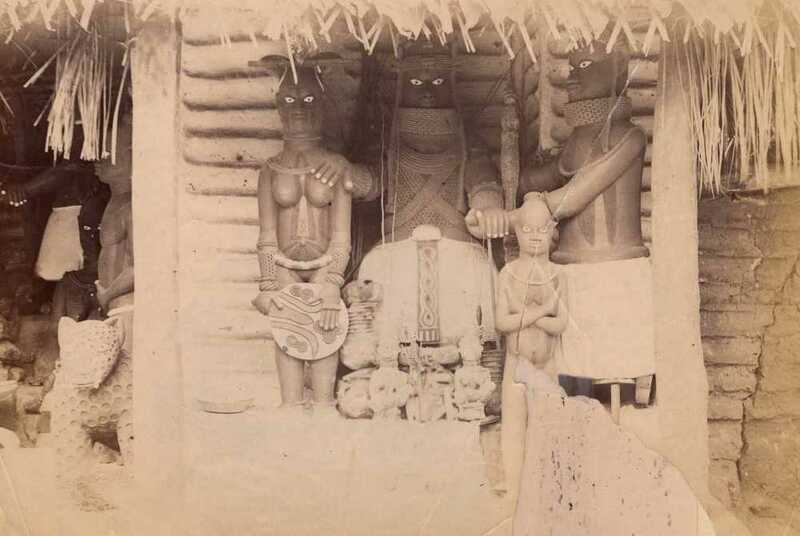 As residence, ritual and administrative center, and site of annual celebrations, the palace was and is physically the center of the Benin Kingdom's capital, with the main market located nearby. Through the centuries, its days were filled by chiefs, priests, citizens, and visitors, but at night it housed only the monarch, his wives, infant children, and male and female pages. Older royal children lived outside the palace and were raised by various chiefs. Many parts of the palace are off-limits to most people. Chiefs belonging to the Eghaevbo n’Ogbe category are affiliated with one of three palace societies and have access only to general spaces and those quadrangles reserved for their specific group: Iwebo, the largest group, concerned mostly with administrative duties, public functions, and royal objects and dress; Iweguae, which cares for the Oba’s ancestors and his royal person; and Ibiwe, which looks after the harem and children. Courtyards have particular functions, as Dmochowski noted; one is devoted to the storage of state drums, another is earmarked for the enisen wardrobe officials. Many of the courtyards are site of altars to various deities, and include visible protective medicines. 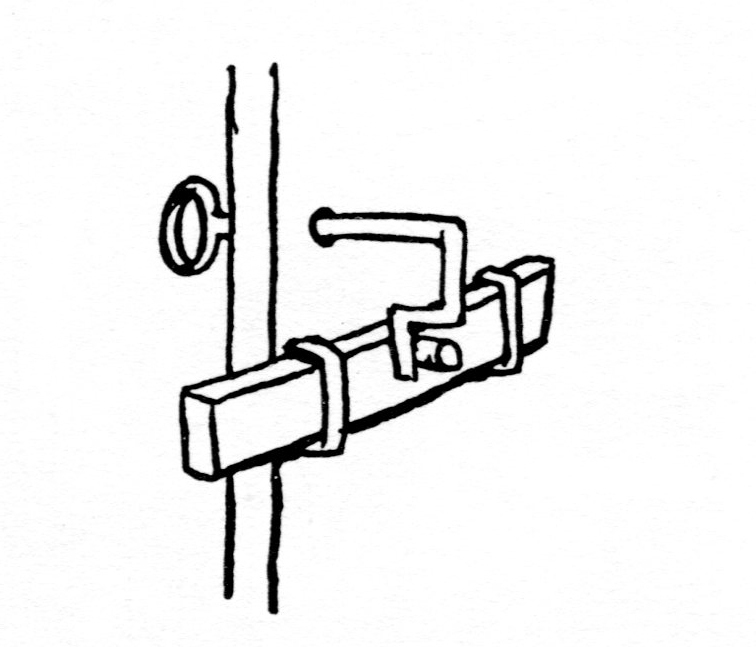 It is likely that the walls themselves contain amulets and other devices, for the British discovered certain bronzes within the walls, invisible to passers-by. 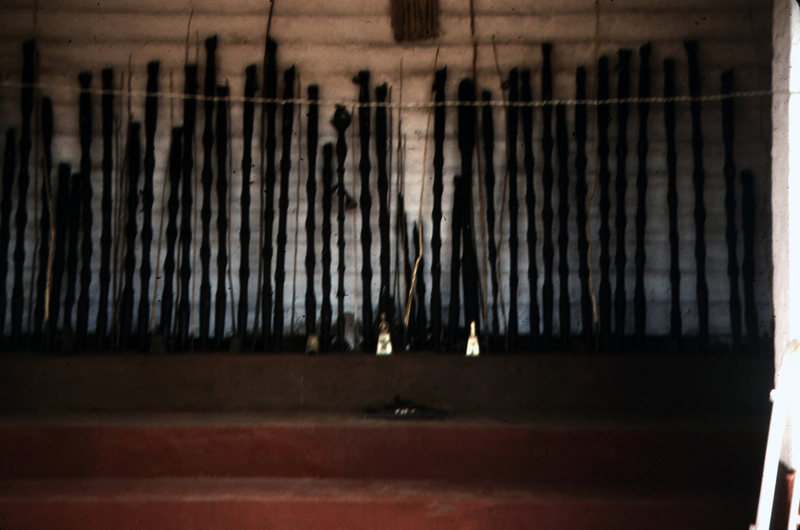 Even on a quiet day, the palace hosts numerous chiefs, pages, and visitors both lofty and humble. At times of royal ceremonies, its grounds flood with people. As an Edo proverb has it, "The palace full to capacity is the Oba's happiness." 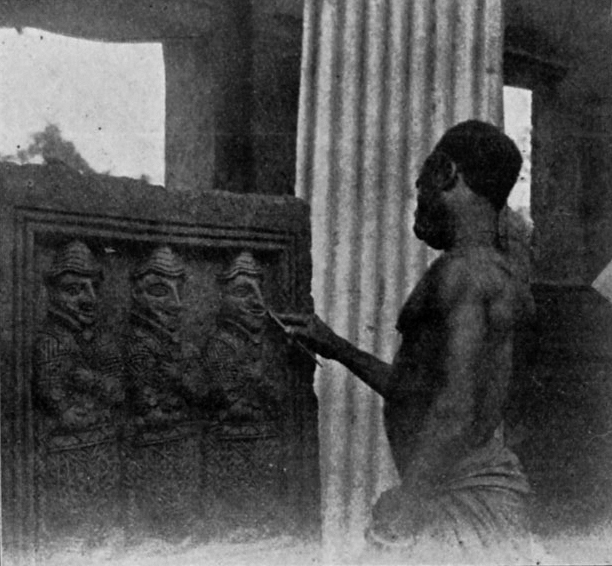 An Artist Modeling a Clay Plaque: This photograph shows an artist modeling three European frontal figures in archaic dress, probably based on 16th-century brass plaques of the Portuguese that were kept in a storeroom at the time of the British invasion. Earthen plaques like this, however, were considerably larger. An artist would have first modeled this clay plaque, allowed it to dry to leather hardness, then inset it into the palace wall. 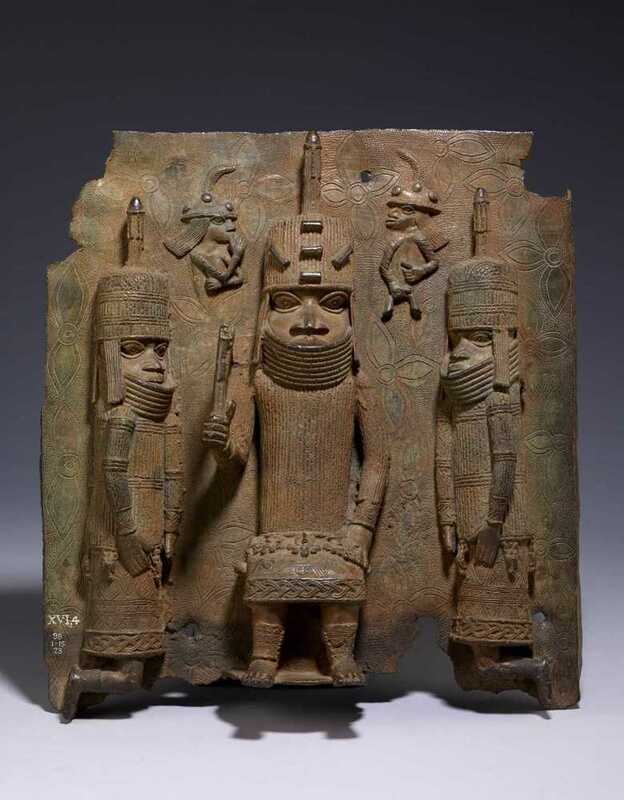 It is unclear which palace guild created such plaques, although the Igun Eronmwon brasscasters were accustomed to modeling clay, the first stage in the lost=wax casting process. The photo itself is curious. If it dates from 1897, as von Luschan indicated, it must have been made for a chief, rather than the Oba, since the latter had been sent into exile. Chief Obaseki and some other prominent chiefs during the palace vacancy did have earthen decorations of this sort. ~ Source: von Luschan, Felix. 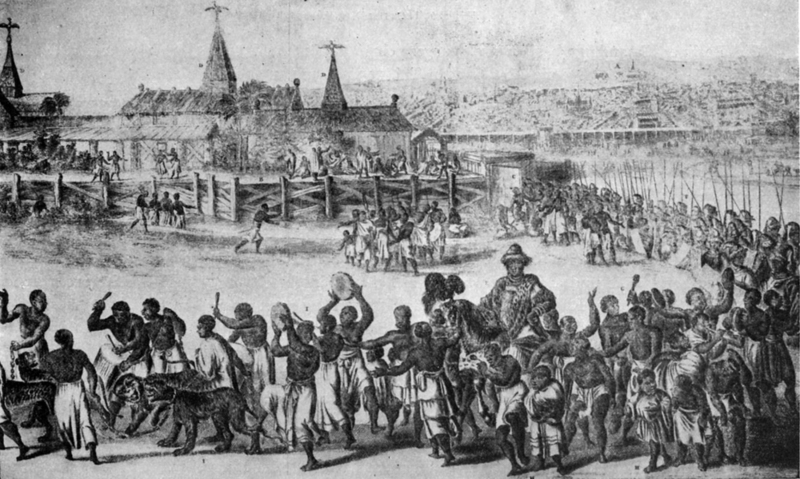 Die Altertümer von Benin . New York: Hacker Art Books, 1968, p. ~ Date: 1890s? Before 1919. 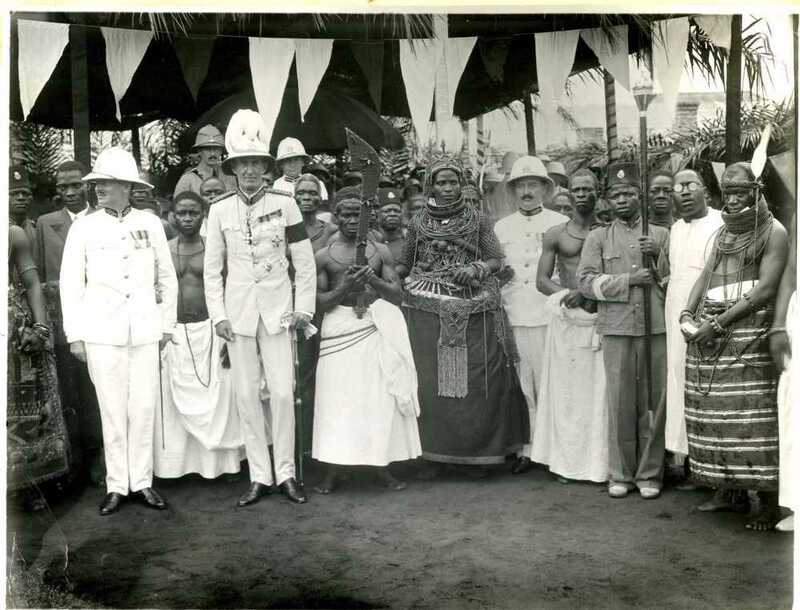 Oba Akenzua II with Nigerian Governor Bernard Henry Bourdillon: This photograph of the formally-dressed Oba Akenzua II and the colonial governor, each accompanied by their entourage, was taken at a palace reception held in the open Ugha Ozolua area in front of the palace. The Oba's swordbearer holds the bead-sheathed ada ceremonial sword, while s military orderly grips his colonial staff of office. The decorative pennants have been a palace standard for festive occasions for many decades. Appointments must be made with the Oba's secretary, except for festival days, when the palace foregrounds are open to all visitors. 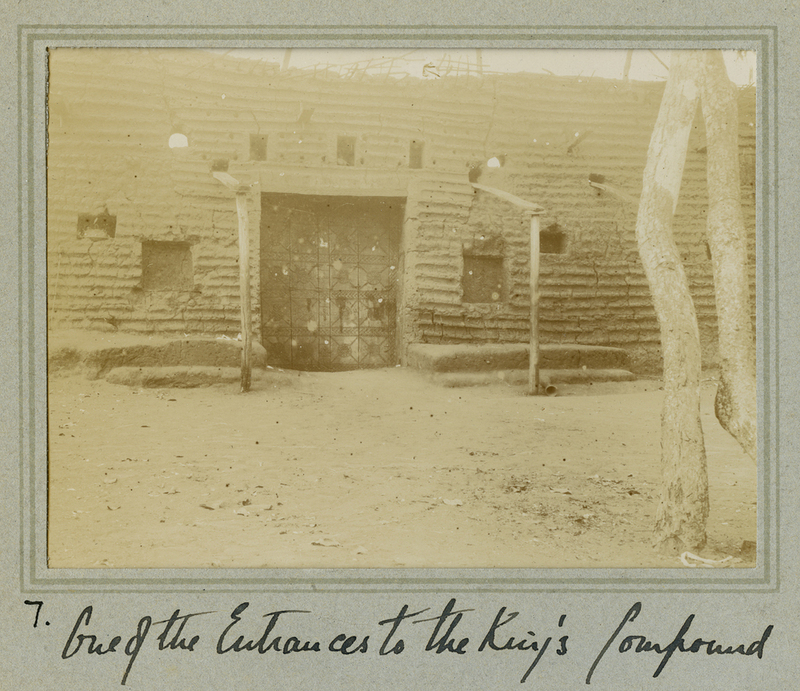 Kathy Curnow, “Oba's Palace, Benin City, Nigeria,” Bright Continent, accessed April 20, 2019, https://access.thebrightcontinent.org/items/show/2. Aisien, Ekhaguosa. 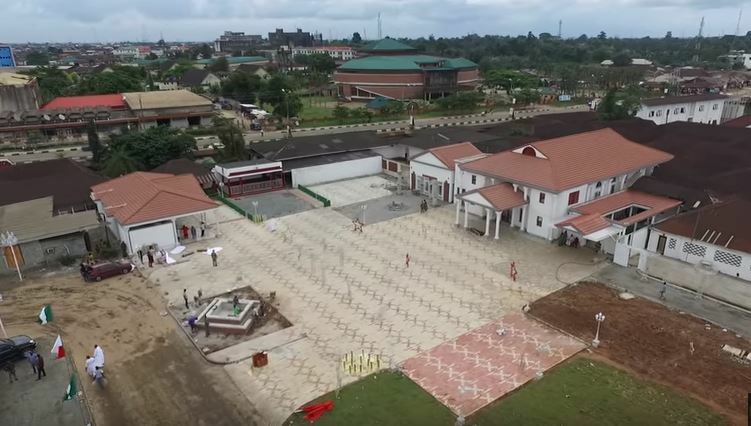 Benin City: The Edo State Capital. 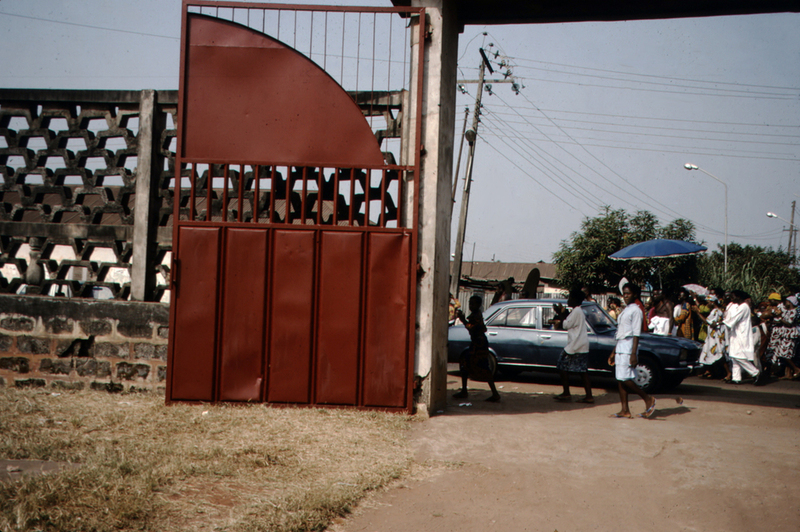 Benin City, Nigeria: Aisien Publishers, 1995. Akenzua, Edun. 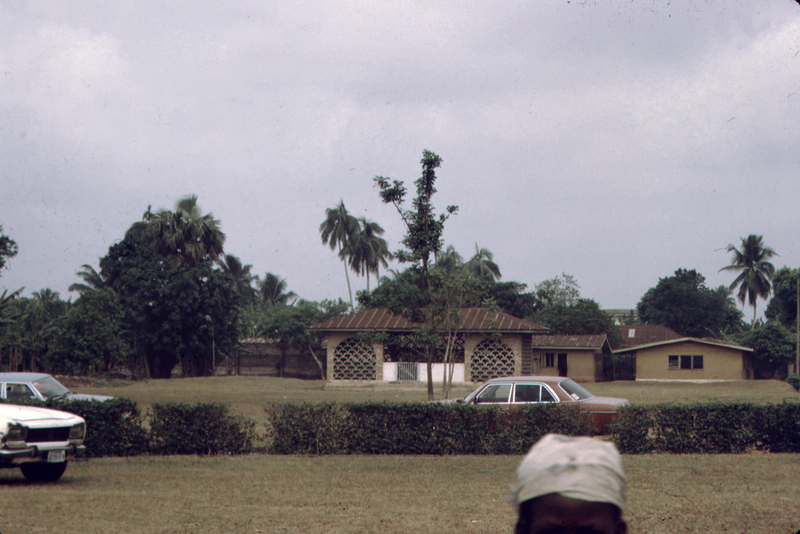 “The Oba’s Palace in Benin.” Nigeria Magazine 87 (December, 1965): 244-251. Ben-Amos, Paula. 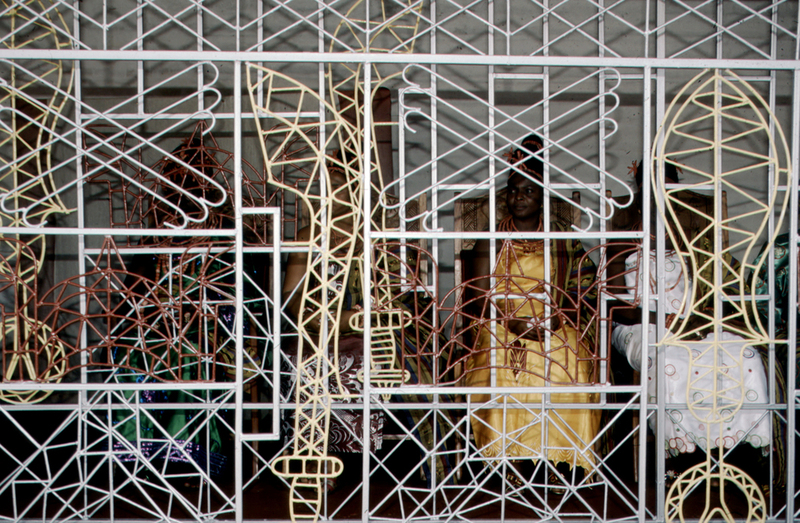 The Art of Benin. London: Thames and Hudson, 1980. Blackmun, Barbara. 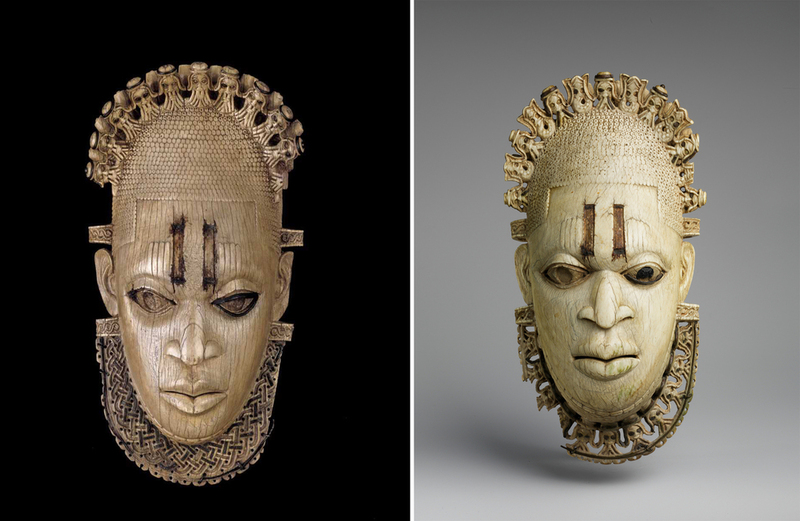 “Obas’ Portraits in Benin.” African Arts 23 (3, 1990): 61-69; 102-103. Connah, Graham. 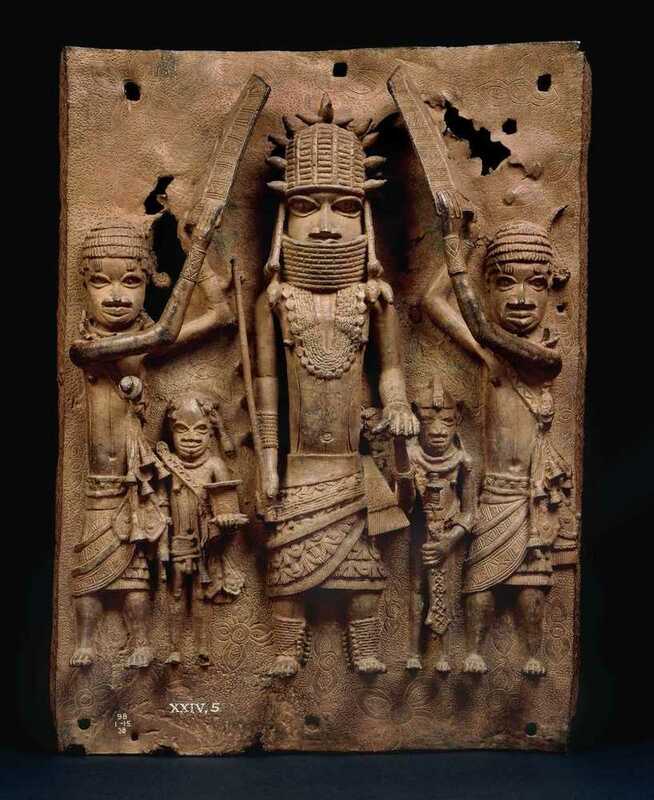 The Archaeology of Benin. Oxford: Clarendon Press, 1975. Curnow, Kathy. IYARE! 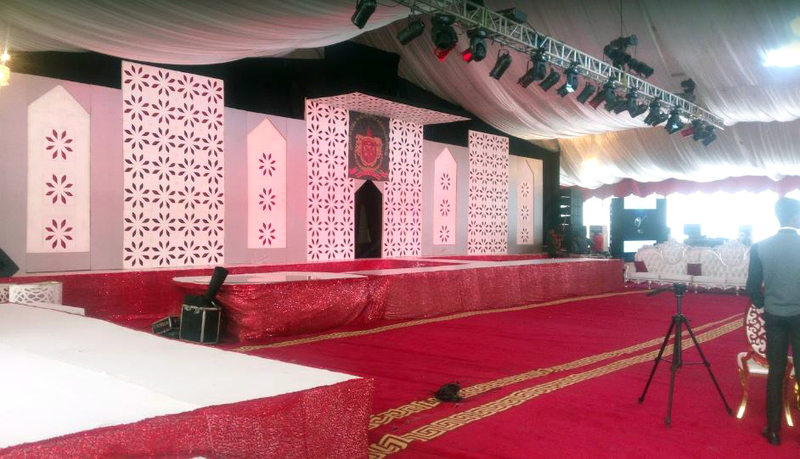 : Splendor & Tension in Benin’s Palace Theatre. Cleveland, OH: Curnow, 2016. Dickerson, Sarah Jane Hollis. 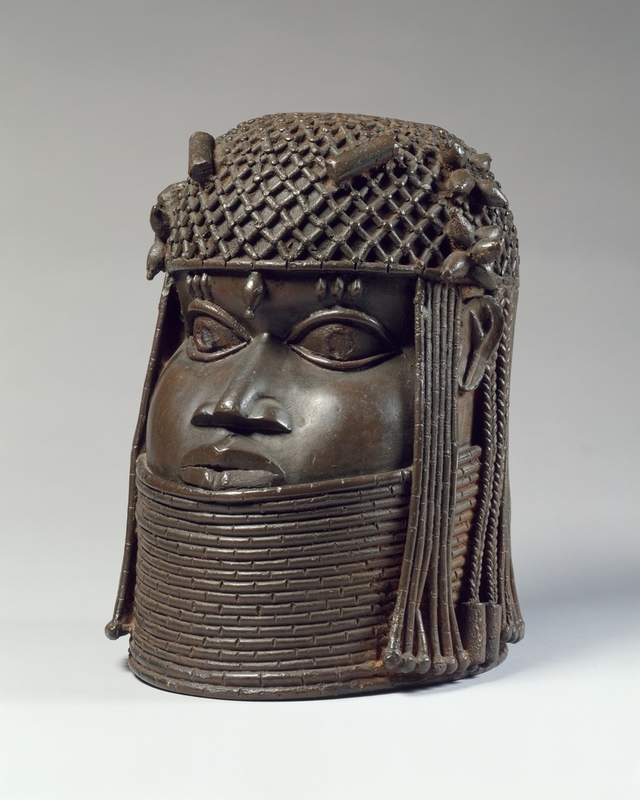 “Benin Sculptor Idah: Court Art and Personal Style.” Interdisciplinary Studies 2 (2, 1979): 16-98. 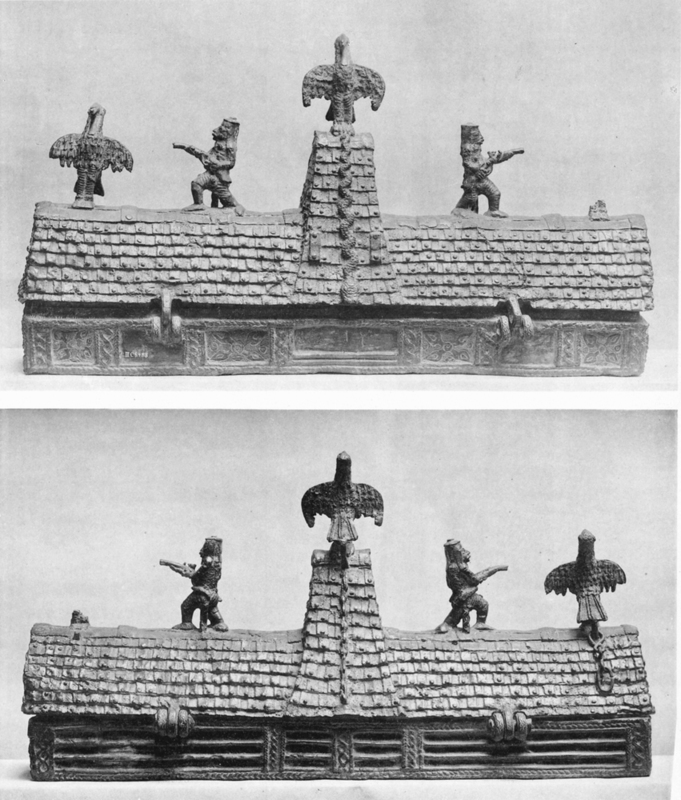 Dmochowski, Z. R. An Introduction to Nigerian Traditional Architecture, vol. 2: South-West and Central Nigeria. London: Ethnographica, 1990. Ebohon, Osemwegie. Eguae Oba n’Edo. 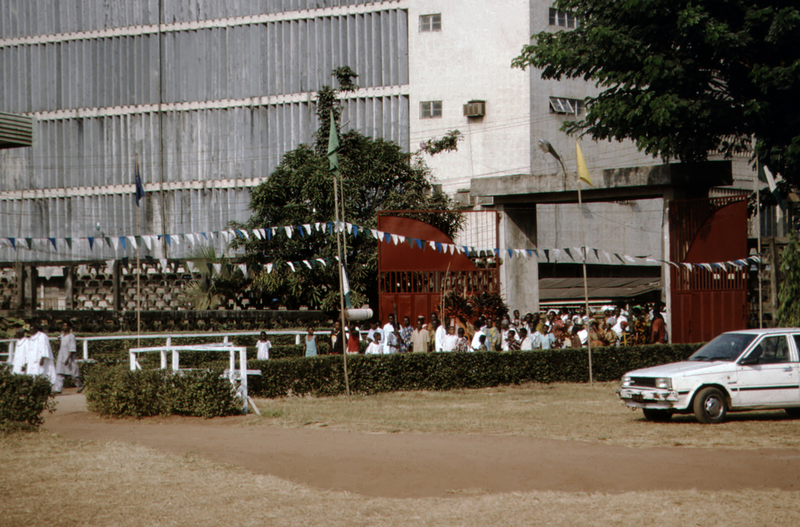 Benin City: Eribo Printers, 1979. Galway, Henry. 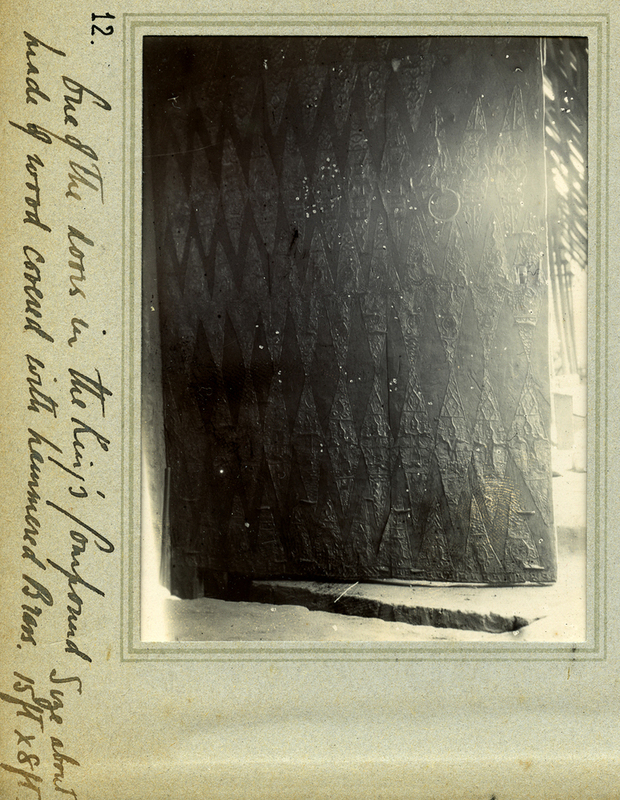 “Benin: Altars and Compounds with additional notes on Benin altars and compounds by G. P. L. Miles.” Ethnologica Cranmorensis (3, 1938): 2-8. Jones, Adam, ed. 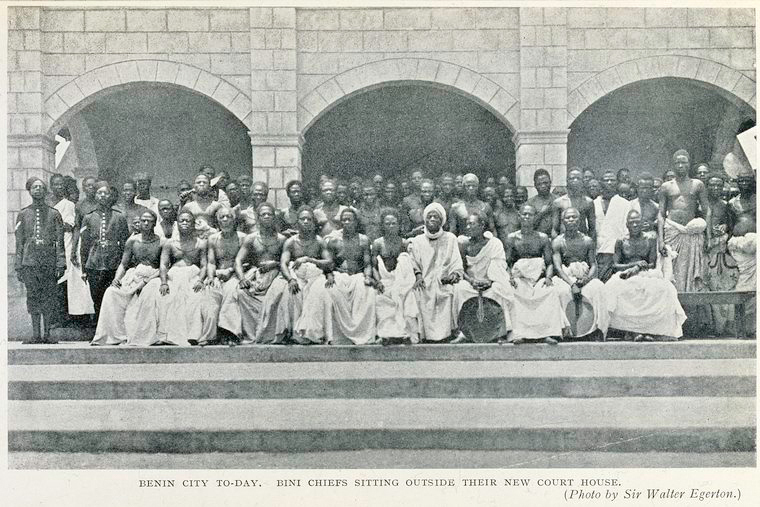 Olfert Dapper’s Description of Benin . Madison: University of Wisconsin-Madison African Studies Program, 1998.
von Luschan, Felix. 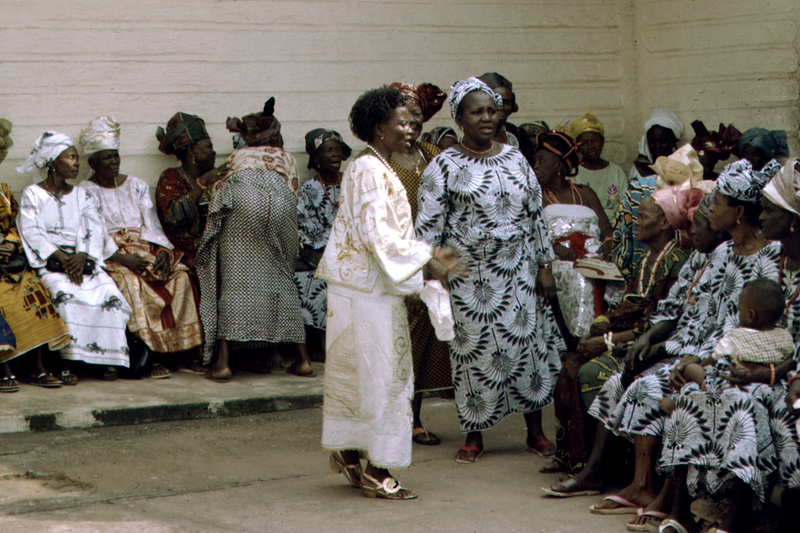 Die Altertümer von Benin . New York: Hacker Art Books, 1968. Nevadomsky, Joseph. 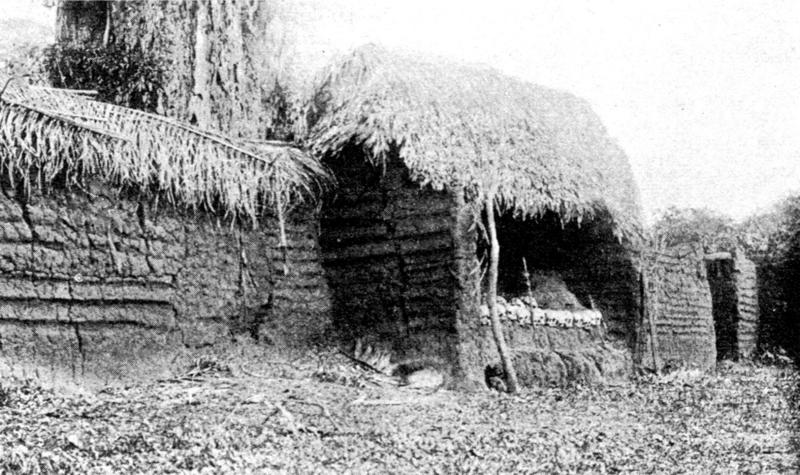 “Palace of Benin.” In Encyclopedia of Vernacular Architecture of the World, vol. 3, pp. 2037-2038. Paul Oliver, ed. Cambridge: Cambridge University Press, 1997. Plankensteiner, Barbara, ed. 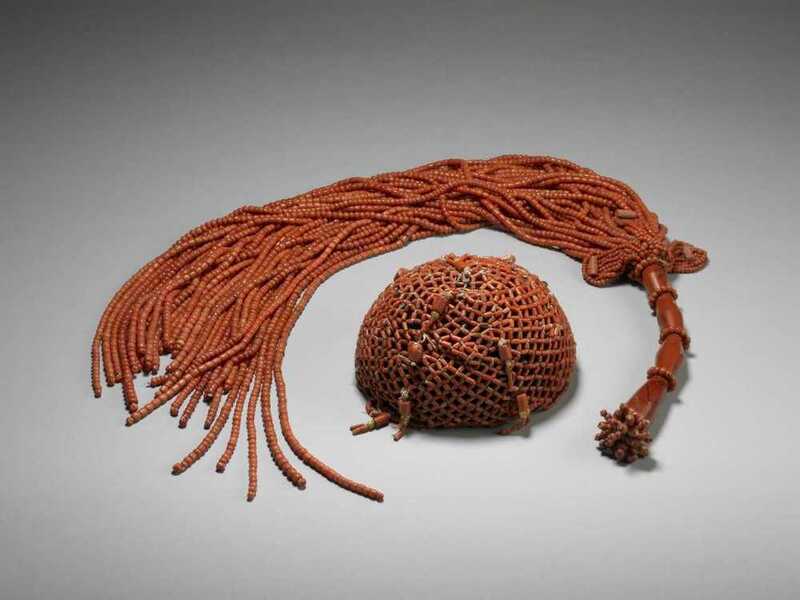 Benin Kings and Rituals: Court Arts from Nigeria. Ghent: Snoeck for the Kunsthistorisches Museum mit MVK und ÖTM, 2007. Roth, Henry Ling. 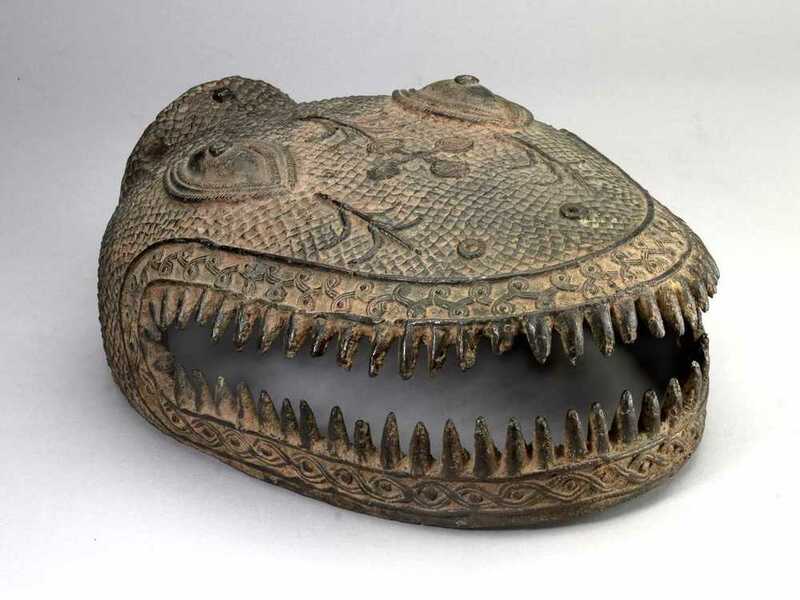 Great Benin: Its Customs, Art and Horrors . New York: Barnes & Noble, 1968. Nevadomsky, Joseph and Ekhaguosa Aisien. 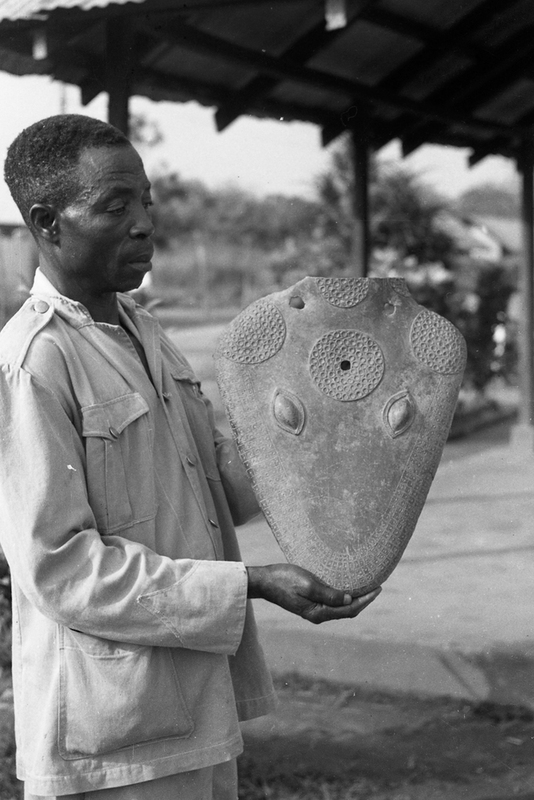 "The Clothing of Political Identity: Costume and Scarification in the Benin Kingdom." 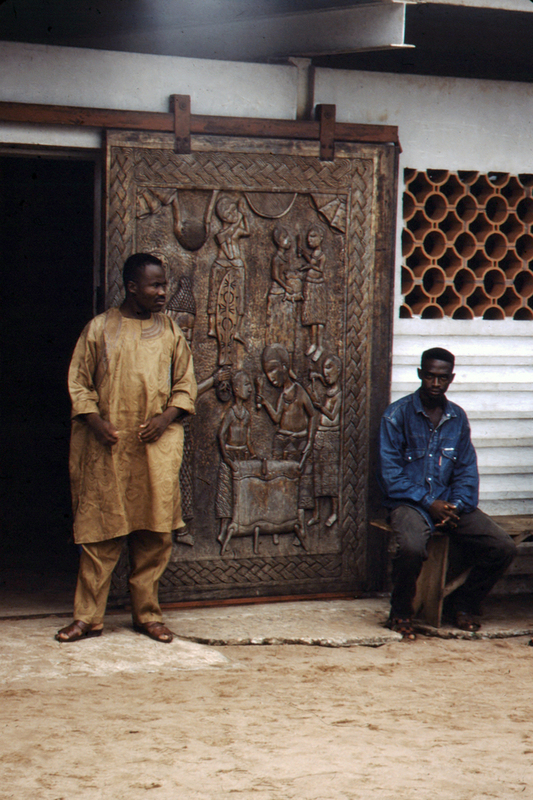 African Arts 28 (1, 1995): 62-73; 100. Curnow, Kathy, "The Art of Fasting: Benin's Ague Ceremony." 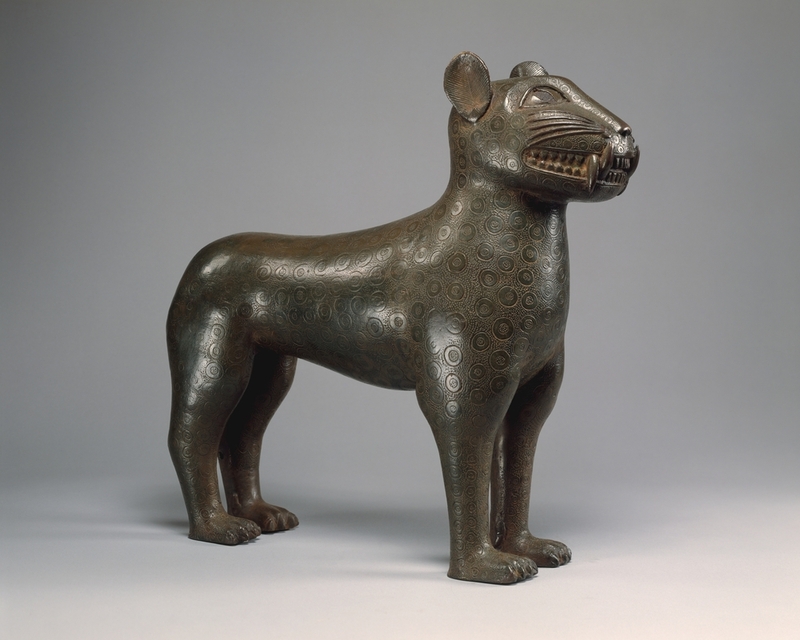 African Arts 30 (4, 1997): 46-53; 93-94. Published on Jul 18, 2017. Last updated on Nov 22, 2017.